I am a theoretical physicist. 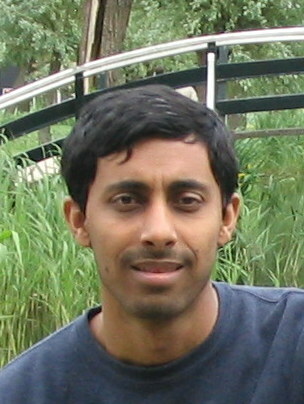 I work at the Chennai Mathematical Institute (CMI) as Associate Professor. I was a Ramanujan Fellow at CMI, an EPSRC Fellow at Durham University, a Marie Curie Fellow with Gerard 't Hooft at Utrecht and a Ph.D. student of S. G. Rajeev at Rochester. Comment on "Spin-Gradient-Driven Light Amplification in a Quantum Plasma"
Other Research Topics: Variational Principle for Large-N Multi-Matrix Models formulated as classical dynamical systems, Approximation methods for Large-N Yang-Mills Theory and matrix models, Non-perturbative structure of Baryons as Solitons in the large N limit of Two-dimensional QCD, Loop space representation of Yang-Mills Theory, Non-commutative Probability Theory.